Deadline has reported (also shared via Daniel's Google+) that Daniel is set to star in Crime Saga Tokyo Vice. A thriller that Anthony Mandler will direct from a script by playwright JT Rogers. Le Grisbi Productions’ John Lesher and Adam Kassan are producing. Production will start early mid-2014.in 2015. 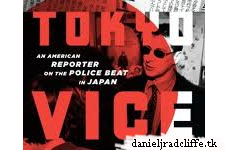 Daniel will play American reporter Jake Adelstein who, while working at the Yomiuri Shinbun newspaper in Tokyo, covered the crime beat and locked horns with yakuza boss Tadamasa Goto, called the “John Gotti of Japan. Update: 6th November 2013. FilmNation Entertainment will finance and commence international sales at the AFM (news via Screen Daily) And filming will begin mid-2014. Update: 2nd February 2014. Production is pushed back. Shooting starts next year as mentioned in this interview (Tokyo Weekender) with Jake Adelstein. So release will probably be in 2016. Update: 7th February 2014. Shooting will start Summer 2015. A bit more info below. The film is based on Adelstein’s memoir detailing how the journalist’s investigating and finally exposing the notorious gangster exacted a high personal cost and sacrifice which included death threats. Adelstein, who will be working with Rogers on the story, is still an investigative reporter who writes for The Daily Beast, The Japan Times, The Atlantic Wire, and is an adviser to Polaris Japan, a non-profit group that combats human trafficking. His second book, The Last Yakuza, will be published next year by Pantheon.